I didn’t know what exactly to expect from these muffins. I was intrigued originally by the relative lack of flour included, all of it whole grain. Most of the body comes from the use of rolled oats, leaving only one total cup of flour to pick up any slack. And slack there is a-plenty; the batter is so thin that the word “watery” would not be inappropriate. You might be tempted to add more flour than is called for to this liquid batter, but you’d be well advised to resist. The oats do a lovely job soaking up all the moisture, and the muffins would be dry and crumbly with any extra flour added. Having said that, the oats don’t cook through totally, which means they remain as toothsome bits throughout each bite. If this sounds good to you, then you’ll be pleased with the rustic texture. If you prefer your muffins more refined, you may prefer to grind the oats first in a food processor, making for smaller, more easily cooked pieces that will give a softer result. Generally, these muffins were flat but fairly pleasant things, with the standard golden-brown coloring. The flavor was decidedly oaty, as might be expected, with nutty backnotes of spelt and whole wheat, mild and inoffensive. Texturally, they had the aforementioned chew of oats, but were otherwise very tender. There is one adjective that sticks in my mind to describe the overall taste: “healthy”. Not great, not bad, somewhere close to fair or middling, but mostly they tasted healthy. Whether they are or not is perhaps best left to the dietitians; but any recipe I choose to hang on to had darn well better inspire more colorful language than these did. 1. Preheat the oven to 350° F. Lightly grease 12 cups of a standard muffin tin. 2. In a large bowl, whisk the egg until blended. Add the olive oil, vanilla, milk, and buttermilk, and combine. 3. In a second bowl, sift or whisk together the flours, sugar, baking soda, and salt. Add to the wet ingredients, and stir together just until all dry ingredients are moistened. 4. 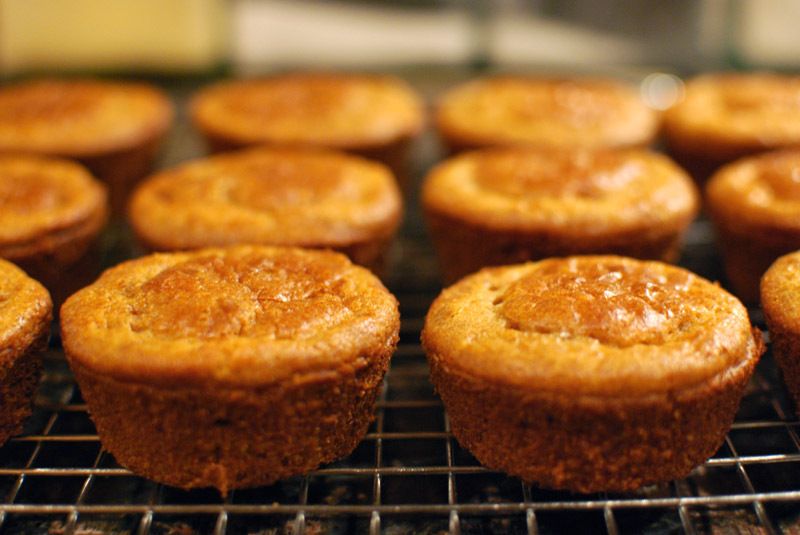 Divide the batter evenly among the 12 muffin cups. Bake at 350º F for 20 to 30 minutes, or until a wooden pick inserted in center comes out clean. Remove from the pans as soon as possible, and transfer to a wire rack to cool slightly before serving. 1. Instead of spelt, feel free to use any other unusual flour you might have sitting around. Buckwheat, teff, or sorghum flours would all be excellent choices here. 2. If possible, try to have all ingredients at room temperature before mixing.